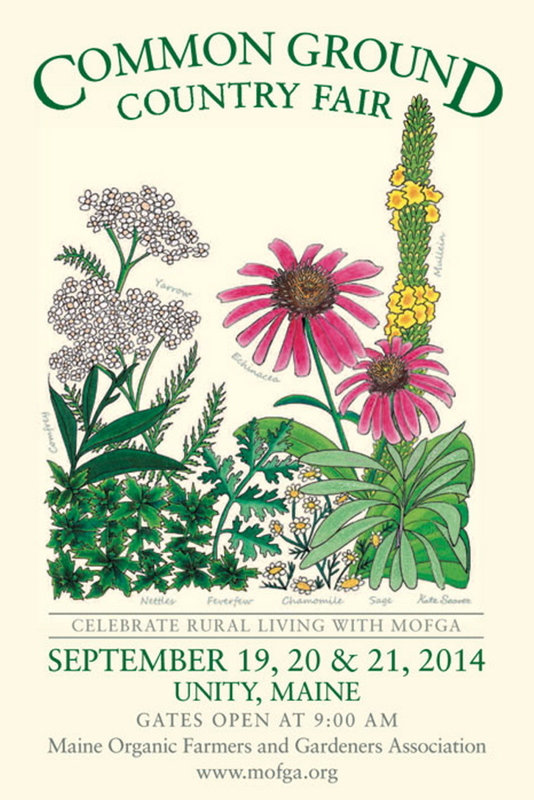 The Maine Organic Farmers and Gardeners Association said Kate Seaver's poster "emits a bright and positive energy." Yet another fabulous poster for the Maine Organic Farmers and Gardeners Association’s Common Ground Fair, this one by Maine native and organic farmer Kate Seaver of Up-Beet Farm in Porter Village. For 33 years MOFGA has held a contest to select the image that will advertise that year’s fair, on posters, t-shirts, bags and the like. Seaver has dreamed of winning that contest since she was a little girl. Now 32, she pulled it off on her very first try with an illustration of medicinal herbs from her own garden. “I love their energy,” Seaver said. “They have a flower, so they’re beautiful, but they also have so many practical uses.” She ticked off the herbs that appear on the poster: feverfew, which she uses to soothe her daughter’s migraines; mullein, for ear infections; comfrey for cuts and bruises; camomile, “a great herb;” and nettles, “I love nettles, even when I get stung by them.” When Seaver was considering what to draw, “the herbs were calling out,” she said. ” ‘Don’t forget about me. I’m everywhere. You can use me and learn about me.’ ” Apparently, they knew what they were about. Seaver studied illustration at Maine College of Art in Portland and worked as a tattoo artist for a time, but has run Up-Beet Farm with her husband, John, for the last two years; they’ve also just started Good Health Grocery in Porter Village. The couple are MOFGA journeypersons, a program that mentors beginning farmers. This year’s fair, held in Unity, runs Sept. 19-21.